Personality: Yudero or Yu for short, is a fun loving shinobi who cares very much about his family and friends. With his friends he is extremely funny and loves to make his friends laugh, by himself he makes himself laugh with the stupidity of his actions. 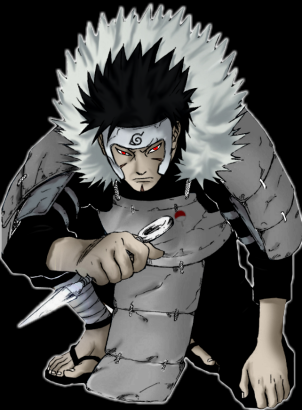 He does however have a darker side as he hates all Sunagakure shinobi regardless of gender or age. He feels like throwing up everytime Sunagakure is mentioned in his presence. Without Sunagakure existing he would be a much happier person. Losing his brother to Suna has made his angry and upset most of the time he is alone, specifically when he is trying to sleep or is thinking about things. Other than this however he is predominantly happy and has no problem socially whether it is discussing politics with his elders or joking around with his friends. Description: Sharingan is the bloodline limit doujutsu of the Uchiha clan. It possesses several powerful abilities, though it is developed through three stages. When just awakened, it is in Stage 1, with only one tomoe located above the pupil; in Stage 2, another tomoe appears, and they are now located to the left and right of the pupil; all three tomoe appear in Stage 3, and they are located in a triangle shape around the pupil: one directly above and the other two to the bottom left and right. The Sharingan is activated by sending some chakra into the eyes. It does not cost much, but only a true Uchiha can have it activated for prolonged periods of time without risking their health. Note: All jutsu copied count against the users total jutsu, and can only be used while Sharingan is activated. Thus allowing the use of jutsu normally not allowed by your fighting style to be used with Sharingan. Only Mangekyu Sharingan is able to copy Kinjutsu. All jutsu can be copied by a shinobi, but what specific move varies from ninja to ninja. Because the Uchiha all have the fire element, that means that they can copy all Fire based jutsu,as well as all non-elemental Jutsu. But, from then on, you can only copy moves that you have the required elements for. IE: Rasengan can only be copied if you take Fuuton for an element. Also, keep in mind, that clan jutsu, from ANY bloodline cannot be copied. Stage 1: This stage allows the user to see things more clearly, and slower than normal. Because of this, it makes it easier to dodge, and hit an opponent, as well as making them faster with hand seals. It also allows the user to see chakra of there opponent, or anyone for that matter, who is around them. Sharingan can now copy all Ninjutsu of there rank or lower. Description: A primary offensive ninjutsu for any fire user, it requires few hand seals and not much chakra. The user will take a breath and exhale a ball or stream of fire. In the former case, it can be launched in any direction, but its speed is not very impressive. In the latter case, it must be aimed at an opponent on the ground within twenty feet of the user, but is executed much faster. Background: Yu was born on October 20th. His life as a shinobi truly began on September 22nd, seven years after his birth. He still remembers the day his mother came into the house, falling into her husbands arms as she cried like never before. She had heard news of her sons passing, Yu's brother had died. From that day on Yu vowed never to let anyone hurt one of his family members again. From that day forward he also hated Sunagakure as though the nation was pure evil, and not just another faction. Yu uses everything in his power to defend his relatives from harm and has succeeded so far in doing so. When he turned sixteen he told himself that he was going to become the next Hokage so he could wage war on Sunagakure and have them wiped from the face of the earth, like he thought they should be. He is seventeen now and is really starting his adventure, albeit a dark one, to defeat his Suna rivals. Besides that he is also looking for the key to unlocking the power of the Sharingan as it is a short term goal toward becoming Hokage. He will need that power in order to defeat Suna and attain control of Konoha. Uchiha is my clan so I want to see a better RPC than this... other than that, since you are an Uchiha you have Katon as your first element, and you only get 3 style points with a bloodline. the 4th point is for sub styles. "Skill is when luck becomes a habit"
Also lyte it is his call on how his character is made in terms of background, You really can't dictate that, I mean as well known as the Uchiha are there were some that were not as impressive, thats how balanced clans work, lighten up maybe he knows what he wants as a character. ok so am i done? whatever, I forget sometimes Im not a mod, so its not my place to say, however, from now on I would like people to PM me if they are going to use a slot in any of my clans. is that better you NaruNazi's? NEVUH MY CHARACTER HATES SUNA lawls and am i done yet???? I JUST WANNA RP MAN!!! !